Over approximately the course of the last decade, extensive studies have been carried out to better establish the linkages between fuels and vehicles and vehicle emissions. One major study, the Auto/Oil Air Quality Improvement Research Program (AQIRP) was established in 1989 in the US and involved 14 oil companies, three domestic automakers and four associate members (“Auto/Oil,” 1997). In 1992, the European Commission also initiated a vehicle emissions and air quality program. The motor industry (represented by ACEA) and the oil industry (EUROPIA) were invited to cooperate within a framework program, later known as “the tripartite activity” or European Auto/Oil Program. In June 1993, a contract was signed by the two industries to undertake a common test program, called the European Program on Emissions, Fuels and Engine Technologies (EPEFE). The Japan Clean Air Program (JCAP) was conducted by Petroleum Energy Center as a joint research program of the automobile industry (as fuel users) and the petroleum industry (as fuel producers), supported by the Ministry of Economy, Trade and Industry. The program consists of two stages: the first stage called JCAP I commenced in FY 1997 and terminated in FY 2001; the second called JCAP II commenced in FY 2002 and will continue until 2007 to provide a further development of the research activities of JCAP I. In JCAP II, studies are focused on future automobile and fuel technologies aimed at realizing Zero Emissions and improving fuel consumption. It has a special focus on studies of fine particles in exhaust emissions. Relying heavily on each of these studies as well as other recent work, the purpose of this chapter is to summarize what is known about the impact of fuel quality on emissions. The use of diesel fuel has been growing dramatically for the past three decades and shows every sign of continued growth in the future. In many countries, diesel fuel receives favorable tax status since it tends to be the fuel of commerce, used both in diesel trucks and in most transit buses. In addition, certain specialized transit vehicles such as Jeepneys in the Philippines are also predominantly diesel fueled. Many countries – including Brazil, South Korea, China and Taipei,China have historically restricted the use of diesel in private cars so that the lower tax on diesel fuel would not distort the light duty vehicle marketplace. These restrictions have recently been lifted in several of these countries in preparation for joining the World Trade Organization (WTO). Diesel vehicles emit significant quantities of both nitrogen oxides (NOx) and particulate (PM). Reducing PM emissions from diesel vehicles tends to be the highest priority because PM emissions in general are very hazardous and diesel PM, especially, is likely to cause cancer. NOx emissions are also important, however, since they cause or contribute to ambient nitrogen dioxide, ozone and secondary PM (nitrates). The growing awareness of the adverse health impacts of diesel vehicle emissions, especially diesel PM, has led to efforts in some countries to constrain diesel use. Cities such as Delhi and Beijing have converted some or all of their buses to operate on compressed natural gas (CNG) because of the serious diesel health consequences. Hong Kong, alternatively, has retrofitted many of its trucks and buses with particulate control devices and shifted most taxis to the use of LPG instead of diesel. Prior to retrofitting the vehicles, Hong Kong reduced the sulfur content in diesel fuel to a maximum of 50 parts per million (ppm). Diesel fuel is a complex mixture of hydrocarbons with the main groups being paraffins, napthenes and aromatics. Organic sulfur is also naturally present. Additives are generally used to influence properties such as the flow, storage and combustion characteristics of diesel fuel. The actual properties of commercial automotive diesel depend on the refining practices employed and the nature of the crude oils from which the fuel is produced. The quality and composition of diesel fuel can significantly influence emissions from diesel engines. 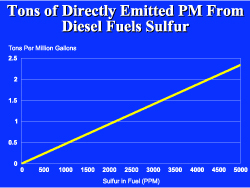 To reduce PM and NOx emissions from a diesel engine, the most important fuel characteristic is sulfur because sulfur contributes directly to PM emissions and high sulfur levels preclude the use of or impair the performance of the most effective PM and NOx control technologies. Most Asian countries have linked their vehicle emissions control programs to the EU or ECE requirements so much of the discussion that follows will relate fuels parameters to different technologies meeting EU standards. Euro 5 emissions standards for light duty diesel vehicles have not yet been adopted by the EU. However, the EU Commission has proposed PM and NOx limits of 5 mg/km and 200 mg/km, respectively, and they will likely become mandatory during the period from 2008-2010. It seems likely that these standards will mandate the use of PM filters on all light duty diesel vehicles. 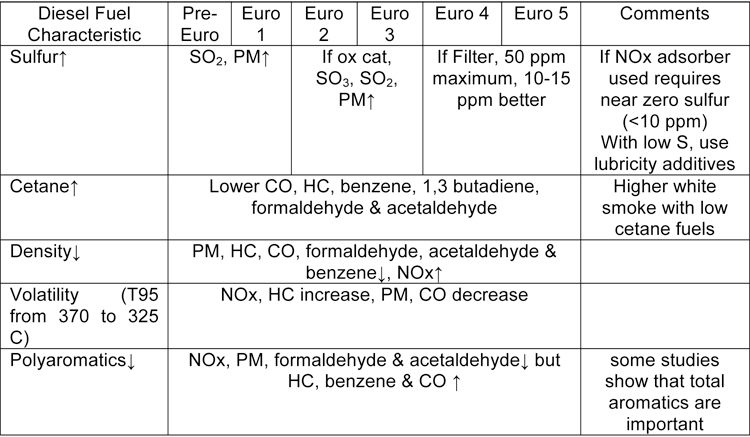 Tables 10.1.1-1 and 10.1.1-2 summarize the impacts of various diesel fuel qualities on emissions from light and heavy-duty diesel vehicles, respectively. The EU Commission has also indicated that it will propose Euro 6 emissions standards for heavy duty engines during 2006 or early 2007, likely mandating the use of PM filters on all heavy duty diesel vehicles from 2010 or 2012. 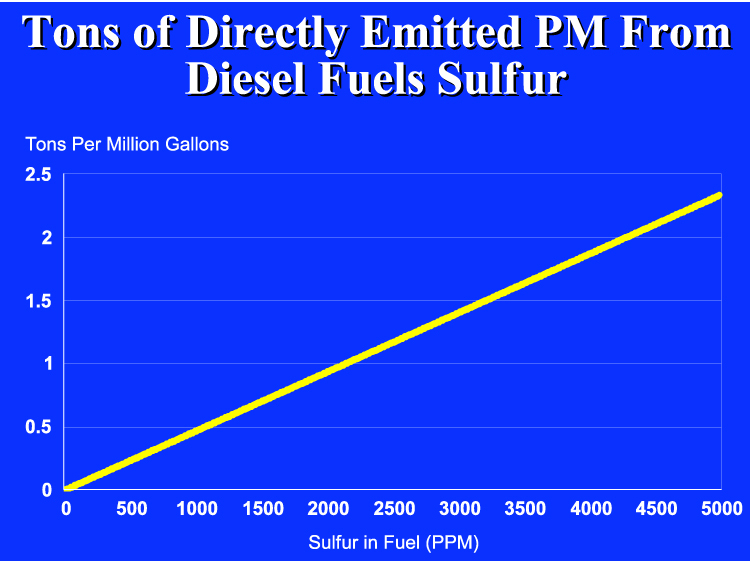 Sulfur occurs naturally in crude oil, and the sulfur content of diesel fuel depends on both the source of the crude oil and the refining process. 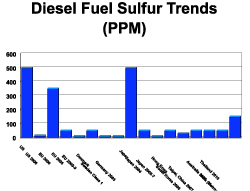 The contribution of the sulfur content of diesel fuel to exhaust particulate emissions has been well established with a general linear relationship between fuel sulfur levels and this regulated emission. Shown in figure 10.1.1-3 is one estimate of this relationship provided by the US EPA. An indirect relationship also exists as some emissions of sulfur dioxide will eventually be converted in the atmosphere to sulfate PM. Light duty diesel engines (less than 3.5 tons GVW) generally require oxidation catalysts to comply with Euro 2 or more stringent vehicle emission standards. Oxidation catalysts lower hydrocarbons, carbon monoxide and particle emissions, typically removing around 30% of total particle mass emissions through oxidation of a large proportion of the soluble organic fraction. The conversion of sulfur in the catalyst reduces the availability of active sites on the catalyst surface and therefore reduces catalyst effectiveness. This sulfur catalyst ‘poisoning’ is reversible through high temperature exposure - the sulfur compounds decompose and are released from the catalyst washcoat. However, due to generally low diesel exhaust temperatures, in many diesel engine applications the conditions needed for full catalyst regeneration may rarely be reached. High sulfur content in the fuel can also lead to the formation of sulfates in the converter which are then emitted as additional particles. 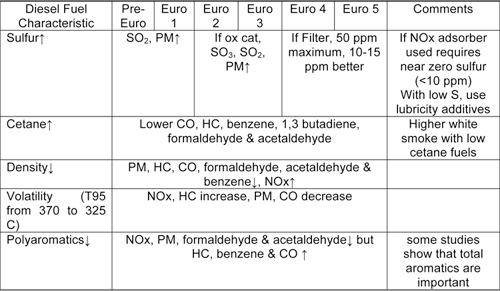 To enable compliance with tighter particle emission standards for diesel vehicles, tighter limits on the maximum sulfur content of commercial diesel fuel have been, or are being, introduced in many countries (see figure 10.1.1-4 below). 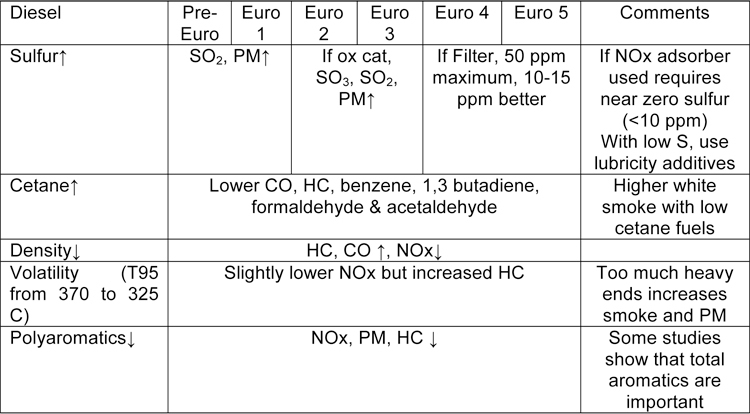 While substantial reductions in particle emissions can be obtained without reducing sulfur levels, compliance with Euro 2 or tighter vehicle emission standards is generally not possible when fuel sulfur levels are greater than 500 ppm because of the relatively greater proportion of sulfates in the total mass of particle emissions. In the case of Euro 3 and Euro 4 vehicle emission standards, even lower sulfur levels (350 ppm and 50 ppm, respectively) in diesel fuel will be required to ensure compliance with the standards. Apart from contributing to the effective operation of catalysts and reducing particle emissions, these further reductions in sulfur levels will enable tighter emission standards to be met by the use of next generation “de-NOx” catalysts, which are very sensitive to sulfur. Many of these systems give optimum performance with fuels having sulfur levels in the range of 10 to 15 ppm or less. NOx control systems for diesel vehicles are still evolving with the two major candidates for Euro 4 and Euro 5 vehicles being Selective Catalytic Reduction (SCR) Systems which are not especially sensitive to sulfur levels in fuel and NOx adsorber systems which are extremely sensitive to sulfur and require levels in the range of 10 to 15 ppm or less. While SCR systems are not particularly sensitive to sulfur levels, they tend to be combined with an oxidation catalyst to reduce ammonia slip and these oxidation catalysts are sensitive to sulfur levels. They will also tend to increase sulfate emissions levels. 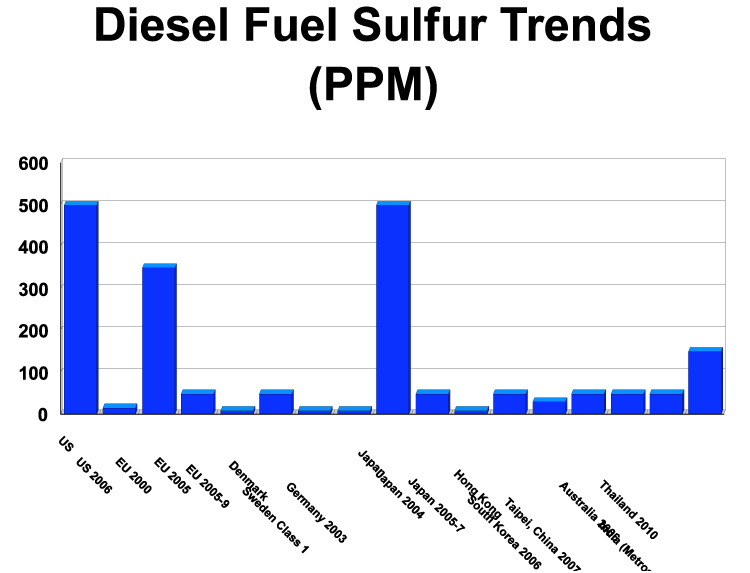 Sulfur content is also known to have effects on engine wear and deposits, but appears to vary considerably in importance, depending largely on operating conditions. High sulfur content becomes a problem in diesel engines operating at low temperatures or intermittently. Under these conditions there is more moisture condensation, which combines with sulfur compounds to form acids and results in corrosion and excessive engine wear. Diesel fuel has natural lubricity properties from compounds including the heavier hydrocarbons and organo-sulfur. Diesel fuel pumps (especially rotary injection pumps in light duty vehicles), without an external lubrication system, rely on the lubricating properties of the fuel to ensure proper operation. Refining processes to remove sulfur and aromatics from diesel fuel tend to also reduce the components that provide natural lubricity. In addition to excessive pump wear and, in some cases, engine failure, certain modes of deterioration in the injection system could also affect the combustion process, and hence emissions. Additives are available to improve lubricity with low sulfur fuels and should be used. Cetane number is a measure of auto-ignition quality. It is dependent on fuel composition, and relates to the delay between when fuel is injected into the cylinder and when ignition occurs. It influences cold startability, exhaust emissions and combustion noise. Rapidly igniting fuels have high cetane numbers (50 or above). Slowly igniting fuels have low cetane numbers (40 or below). Aromatic hydrocarbons are low in cetane number; paraffins are high, with napthenes in between the two. The cetane index provides an indication of the ‘natural’ cetane of the fuel. It is derived through a calculation process based on the fuel density and distillation parameters. It gives an estimation of the base auto-ignition quality of the fuel, but does not indicate the effects of cetane improver additives. 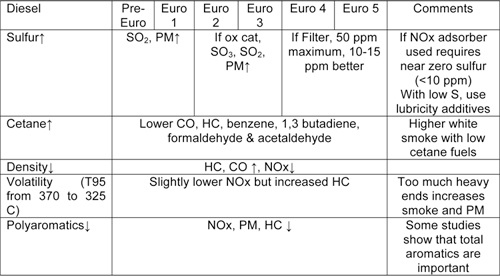 Experiments documented by the EPEFE study show that an increase in cetane number results in a decrease in carbon monoxide and hydrocarbon emissions (notably in light duty engines), nitrogen oxides emissions (notably in heavy duty engines), as well as benzene, 1,3 butadiene, formaldehyde and acetaldehyde emissions from light duty engines. While the EPEFE study found that particle emissions increased from light duty vehicles as the cetane number increased (no significant effect was seen in heavy duty engines) other research has suggested that an increase in cetane number can lead to lowered particle emissions. Cetane number requirements for diesel vehicles depend on engine design, size, nature of speed and load variations, and on starting and atmospheric conditions. High cetane number fuels enable an engine to be started more easily at lower air temperatures, reduce white smoke exhaust, and reduce diesel knock. With a low cetane number fuel, engine knock noise and white smoke can be observed during engine warm-up, especially in severe cold weather. If this condition is allowed to continue for any prolonged period, harmful fuel derived deposits will accumulate within the combustion chamber. While an engine may appear to operate satisfactorily on low cetane number fuel, after prolonged use, severe mechanical damage (e.g. piston erosion) can result. An increase in natural cetane can contribute towards reduced fuel consumption. To avoid excessive dosage with cetane additives, the World Wide Fuel Charter (WWFC) recommends that the difference between the cetane index and the cetane number be no greater than 3. (Generally large quantities of additive are not added for economic reasons, as the additive is expensive). This has also been general practice to prevent having the general character of the fuel too far from that implied by a certain cetane number. Density relates to the energy content of fuel in such a way that the higher the density of the fuel the higher its energy content per unit volume. The density of diesel fuel is largely dependent on its chemical composition – typically the aromatic content and distillation range. Higher density diesel fuel is frequently an indicator of high aromatic content of the fuel, for a given distillation range. Increased aromatic content is known to lead to increased particle emissions. Too high a fuel density for the engine calibration has the effect of over-fuelling, increasing black smoke and other gaseous emissions. -	For light duty vehicles, reducing fuel density decreased emissions of particles, hydrocarbons, carbon monoxide, formaldehyde, acetaldehyde and benzene; increased emissions of NOx; but had no impact on the composition of the particle load. -	For heavy duty vehicles, reducing fuel density decreased emissions of NOx; increased emissions of hydrocarbons and carbon monoxide; but had no impact on particle emissions or the composition of the particle load. The EPEFE study also investigated the extent to which the observed density effects on emissions could be decreased by tuning the engine management system to fuel density. The test results indicated that the effect of density on engine emissions is, to a certain extent, caused by the physical interaction of fuel density with the fuel management system. Further density effects remained after engines were calibrated to specific fuels. CONCAWE investigations have shown that changes to engine calibration can considerably reduce the impact of changes in density (and viscosity) on emissions. Density effects could therefore be compensated for by changes in engine calibration. Density levels are also influenced by T95 distillation maximum limits (discussed in more detail below) through their impact on the heavy fractions of the fuel. These limits could also be adjusted to compensate for density impacts. Distillation is a reference to the volatility profile of diesel fuel. The distillation or boiling range of the fuel is a consequence of the chemical composition of the fuel meeting other fuel property requirements such as viscosity, flash point, cetane number and density, within a particular refinery’s overall product slate. Volatility can influence the amount and kind of exhaust smoke that is emitted. Correct distillation characteristics are therefore essential for efficient fuel combustion. This is achieved by the careful balancing of the light and heavy fuel fractions (parts) during the refining process. Heavy fractions have high energy content and improve fuel economy, but can cause harmful deposit formation inside engines. Light fractions reduce the overall viscosity to provide better fuel injection atomization, easier engine starting and more complete combustion under a variety of engine conditions, but they do not have as much energy per unit volume of fuel (i.e. density) as heavier fractions. The distillation curve of diesel fuel indicates the amount of fuel that will boil off at a given temperature. The curve can be divided into three parts: the light end, which affects startability; the region around the 50% evaporated point, which is linked to other fuel parameters such as viscosity and density; and the heavy end, characterized by the T90 (temperature at which 90% of the fuel will evaporate), T95 and final boiling points (FBP). Investigations have shown that too much ‘heavy ends’ in the fuel’s distillation curve can result in heavier combustion chamber deposits and increased tailpipe emissions of soot, smoke and particulate matter. The effect of T95 on vehicle emissions was examined in the EPEFE study which indicated that exhaust gas emissions from heavy duty diesel engines were not significantly influenced by T95-variations between 375°C and 320°C. However, a tendency for lower NOx and higher hydrocarbon emissions with lower T95 was observed. Crude oils contain a range of hydrocarbons including polyaromatic hydrocarbons (PAHs). They are heavy organic compounds found mostly in diesel particulate matter but can also be present in the gas phase. PAHs are also referred to as polynuclear aromatic hydrocarbons and polycyclic aromatic hydrocarbons. A consequence of higher aromatic content in the fuel is poorer auto-ignition quality, increased thermal cracking and peak flame temperatures – and delayed combustion processes. From a combustion perspective aromatics are, in general, a poor diesel fuel component. -	For light duty vehicles reducing polyaromatics decreased NOx, PM, formaldehyde and acetaldehyde emissions, but increased hydrocarbon, benzene and carbon monoxide emissions. Ash forming materials (incombustible mineral material) may be present in diesel fuel in two forms - as suspended solids or as hydrocarbon soluble organo-metallic compounds. Ash forming materials present as suspended solids may contribute to fuel injector and fuel pump wear, which are critical issues in engines needed to meet tighter emission standards. Ash forming materials present as soluble organo-metallic compounds have little effect on wear of these components but, like suspended solids, can contribute to combustion chamber deposits, most critically on fuel injector tips, which can then influence emissions performance – specifically of fine particles. While levels of suspended solids may be substantially reduced by engine fuel filters, dissolved organo-metallic compound levels are not reduced in this way, and require management by other means. The issue of the use of recycled waste oil as diesel extender has the potential to increase the ash content of the fuel. The viscosity of a fluid indicates its resistance to flow; the higher the viscosity, the greater the resistance. It is a property that, along with density and distillation range, is an important indicator of the fuel’s overall character. Viscosity of diesel fuel is important for the operation of fuel injection equipment that is required to accurately measure small quantities of fuel prior to injection and to atomize the fuel in the injection process. Fuel with low viscosity can result in excessive wear in some injection pumps and in power loss due to pump injector leakage. Spray may not atomize sufficiently, therefore, combustion is impaired and power output and fuel economy are decreased. This can have adverse effects on emissions performance.